First day back at work, and it was incredibly productive. Six new campaigns launched and two training sessions for our new VP of federal sales. All in all, I was rather pleased. 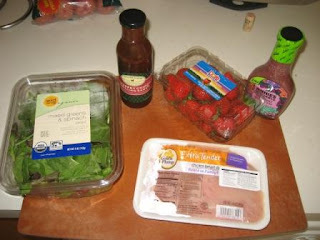 Michelle and I decided that tonight should be a nice-light dinner, watching Deadliest Catch and Project Runway. For some reason it never occurs to me to do a crab boil on Deadliest Catch night. I'll have to remedy that next season. For something light, I decided against beef, and figured a nice salad would do. However, as easy as a mixed green salad with balsamic is, I figured that it wasn't much more work to actually make something a bit more appealing. After a swing by Cub on the way home to pick up some chicken, I ended up with a quart of strawberries (they were by the front door, I couldn't resist) as well. 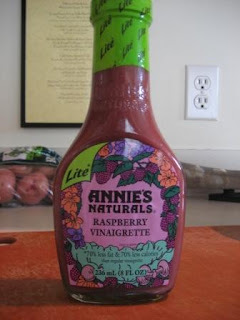 Knowing that I had a bottle of Archer Farms Raspberry-Chipotle grilling sauce in the fridge, I decided to put it to good use along with the strawberries and a dash of Annie's Raspberry Vinaigrette. 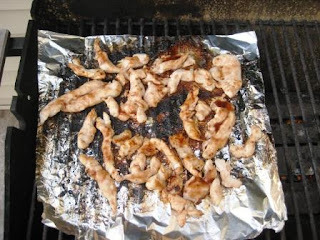 Deciding to use chicken strips instead of whole breasts meant that I had to use some foil on the grill, else I would have chicken strip charcoal briquettes dangling between the grill slats. That's not a pleasing thought at all. Actually, this worked rather nicely, as the browned more evenly, and in the final few minutes of cooking, when brushed with the glaze, they were able to simmer in the drippings rather than the glaze simply charring. 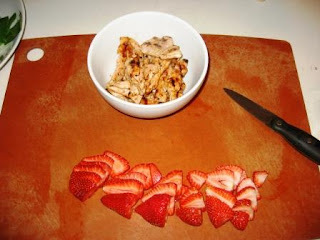 Next step was to pull the chicken and slice the strawberries. So far, we're looking at around 12 minutes from prep to completion at this point, so I'm relatively happy. 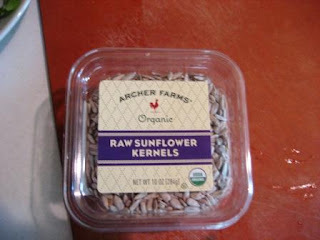 Then sprinkled with raw sunflower kernels for good measure before the chicken is placed. 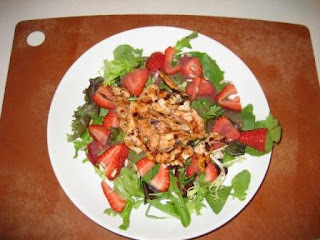 And voila, mixed baby greens with raspberry-chipotle glazed chicken, strawberries, sunflower seeds and raspberry vinaigrette. We were happy with this dish. Next time, however, we want to try walnuts instead of sunflower kernels and maybe add buffalo mozzarella or Gorgonzola as well.